A luxury foaming bath of gold and vanilla. Three Gold Rings is a bath of bling, for days when what you need most is a bit of luxury and a sense that all is well with the world. Just Three golden rings not five! This bubble bar looks rather smaller than some of the others and despite that it has quite a hefty price tag of £3.75 which is quite a lot if you use it all in one bath. It is rather luxurious looking though and is in subtle colours of gold and cream and the gold circles are in three gold rings; hence its name. This is one of the special Christmas products which Lush has brought in specifically for the festive season. If after reading the review you decide you want to try this then you need to do it before the end of the December Christmas selling period as they usually stop making the Christmas stuff just before Christmas. This bar is not very big and is flat and circular in shape with a sort of mound rising in the middle; it is about half the size of a ‘Comforter bar’ to give you an idea of size. I usually get four good bubbly baths from a ‘Comforter bar’ but this only just gave me three so it isn’t the cheapest one in the range but in my view it is one of the nicest but it does depend on which scents you like. For Lush aficionados if you know and love the smell of ‘Crème Anglaise’ cream then this is the bubble bar for you as the scent is very similar. I got my first Three Gold Rings Bubble bar just a couple of days ago and I just couldn’t wait to use it and so it never managed to get into my drawers to have its time scenting my undies. I used it for the first time on the day I bought it and because of the price I was determined to get more than two baths from this and so I broke off about a third for my first bath experience with this golden and cream bar. Just in case anyone has not tried a Lush bubble bar, the idea is that you crumble the bar as your bath is filling and then enjoy a huge mountain of luxuriously softening and moisturising scented bubbles. I usually keep my Lush stuff in my drawers for a few days at least to enjoy the scents through my clothes first as that way I never by any drawer scented liners and my clothes always have a “Lushious “smell about them. Both Crème Anglaise Body lotion and Three Gold Rings are inspired by desserts such as Crème brûlée or Crema catalana or indeed Crème Anglaise . The first two are my favourite desserts which is odd seeing as I hate the taste of eggs and will not eat egg custard! Crème Anglaise is actually a light pouring sauce and is a mix of sugar, egg yolks and hot milk, usually flavoured with vanilla. What I would call real custard rather than ‘Bird’s powder custard. Now the Lush version is far more strongly scented than any of these delicious desserts which give inspiration for Crème Anglaise and this bubble bar. Simon, one of the Lush magicians in their creation laboratory invented the glorious vanilla fragrance of myrrh resin, sweet orange oil and vanilla absolute that in both the Crème Anglaise body lotion Simon’s fine vanilla fragrance of myrrh resin, sweet orange oil and vanilla absolute that he developed for our Crème Anglaise body lotion and this bubble bar . I already said I couldn’t wait to use my ‘Three Rings’ bubble bar so you can tell how tempting the smell was to me. I thought it would be a perfect birthday treat and the first time I used it was on my actual birthday as we didn’t really do much on the actual day to celebrate as most of our celebrations were on the week end. I took my bubble bar out of its yellow paper recyclable bag and had a sniff. Lovely luxurious creamy sweet orange, vanilla and myrrh scent filled my nostrils and I looked forward to enjoying this in my bath. The scent is actually quite strong but subtle, like the Crème Anglaise cream that is so lovely but expensive made by Lush, it is almost good enough to eat. Okay being rather ‘careful with money’ I NEVER use a whole bubble bar in my bath usually I can get two or three baths from one bar and I broke off about a third of this one I crumbled it under the hot tap coming into my bath. I sat and watched as the bubbles began to grow and the wonderful gold shimmer in the swirling waters. I sniffed and that truly gorgeous and luxurious scent of creamy vanilla and myrrh rose up in the steamy vapours from my filling bath. My bathroom was being filled with the lovely smell of creamy sweet vanilla and exotic myrrh while my bath had a golden glow which glistened through the water. It isn’t glittery so I wasn’t covered in glitter which I was happy about as I usually avoid glitter as it gets everywhere. This is another of those scents that gives you a warm and fuzzy feeling, perfect for a winter’s evening bath. The bubbles from my third of a bar give me a really bubbly bath; they were abundant and thick as they normally are when I treat myself to one of these. Bearing in mind the price of £3.75 I don’t think I’m being unreasonable in expecting at least two baths and more usually three as in this case that is still £1.25 per bath and there were still plenty of bubbles for me. Now we move onto the feel in the bath. I am never disappointed Lush bubble bars as they always makes the water feel creamy and soft and I found with this I needed no soap or other cleaning agent I just soaked in the bath and enjoyed luxuriating in my bath of creamy vanilla and myrrh bubbles and enjoyed the caressing smooth feel of the moisturised water warmingly soothing and caressing my tired joints and oozing into my dried old skin! My nose did really pick out the vanilla and the exotic myrrh which combines perfectly to create the scent which is Crème brûlée but without any calories. What are the benefits of this bar in terms of essential oils? The sodium bicarbonate and tartaric acid make the water soft. Lauryl Betaine is there to make the bubbles. This has not been found to cause any health concerns according to the www.goodguide.com which is good. 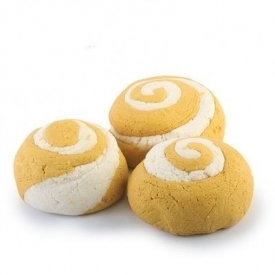 The scent for this bubble bar comes from the sweet orange oil, vanilla absolute and myrrh resinoid which are all natural and combine beautifully to create this scent. The Cocamide DEA is a viscosity, thickening and foam booster but once again there have been stories about links with cancer. The storage and handling precautions are also a little worrying. See http://www.useful-chemicals.com/?p=39 . Benzyl Salicylate is a clear colorless liquid with a sweet floral aroma. It is an ester of benzyl alcohol and salicylic acid and has been associated with allergies so care needs to be taken if you are sensitive to things that might cause an allergy. So if you are concerned I would suggest you investigate more thoroughly the ingredients just so you know what you are using. Some of the above ingredients can be irritating to skin too; my step daughter cannot use these products as she gets bad eczema if she does. So all in all what do I think? I really like this bar it certainly up there as one of my favourites. It is not one of the pretty and feminine products. The price is what would put me off buying this one too often but the scent is just a delicious creamy sweet a combination of vanilla, orange and the myrrh; it is my favourite dessert in a bath product so it has no calories either. I didn’t notice that the bath tub was left with any tinge of the gold after the water has gone so that was a plus as I always have to check for any residue and I usually have to give a good rinse of the tub straight away to avoid any potential staining of my white tub. Limited edition and does have some not so great ingredients. makes bath slippy - ment to be single use so not good value for money , however you can split the bar to use it more than once if you don't mind a weaker scent and less bubbles! "This bubble bar looks rather smaller than some of the others and despite that it has quite a hefty price tag of £3.75 which is..."